Hello, and welcome to the first Mixed Media Card Challenge! Now, if you're thinking mixed media isn't for you because you're more of a CAS person, just stop and look and think. A little texture, a die cut, some thread, some ink, some embossing powder = more than one medium. You're probably already doing it on your cards, aren't you? And you can have as much white space as you want, you don't have to colour the whole card or throw everything on it. You do have licence to get a little messy - if you want. If you're still not sure what constitutes a mixed media card, click here for the lowdown. So today's theme is a touch of nature with an optional element of a tag. I swooshed a piece of cotton canvas into Distress Inks and stamped on it once it was dry. The die cut flower (Tim Holtz Tattered Florals) was languishing in my stash already sponged so I added some Stampendous Frantage embossing powder to the centre and also onto the base card. Frantage is best heated from below otherwise the big globules of powder will just blow away. I wrapped a bit of gold thread and placed it behind the flower, then added a sentiment from the new STAMPlorations release (Vignette: Celebrate Artsy). This is so beautiful Shirley! Congrats and this is gorgeous! Love it! Wow Shirley! love that lumpy embossing powder and the loops of gold thread woven in! Awesome card Shirley!! I lOVE the CAs look with the MM!! So glad to be on the team with you! Wunnerful! Love the embossing powder. Gorgeous - you can do just about anything! This is so terrific Shirley, I love the way u incorporated the canvas :) awesomeness ! A great card Shirley. love the simplicity of it. Love the inked piece of cotton canvas! Fabulous mix of elements! Lumpy embossing powder - I seriously have never heard of it! I'm so glad that you are right on top of these new trends and that you share the info with us, otherwise I'd be sooooo out-of-the-loop! Hi there Shirley! I'm getting the idea that yellow is one of your favourite colours! Notice I used butterflies! I love your gorgeous CAS/Artsy design - perfect! I absolutely adore this card! 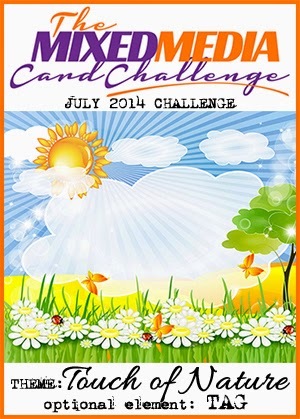 I stumbled across it when I was browsing through the Mixed Media Card Challenge Blog. I, too, am a huge fan of incorporating fabric into art and thought your use of it here was brilliant! I also love the "swirl" of gold thread. The flower is stunning and the sentiment is perfect! I liked how you mixed scripts and fonts to give the card such an eclectic look. Gorgeous all the way around! Congrats on your DT gig, Shirley! Amazing texture and colors...just gorgeous! So many wonderful cards/tags by the DT, Shirley. But, yours is my favorite of all - I love that you created a collage and still managed to keep it clean and simple. Thanks for the inspiration.